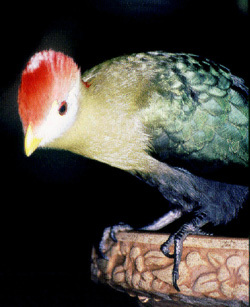 Traditionally Touracos have been included in the cuckoo order of “Cuculiformes”. They are weak of flight but capable of running quickly through the tree canopy. They are usually brightly coloured. 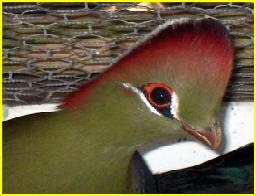 The Red-crested Touracos owe their name to a conspicuous, colourful feather crest. 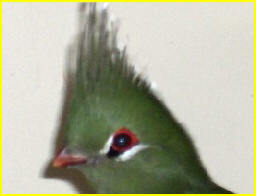 The side of the head and the usually featherless ring around the eye are equally colourful. They measure around 40-43 cm (16-17") and weigh between 225-290 grams. They eat a wide variety of freshly diced fruits such as apple, banana, papaya, grapes, plus chopped greens and soaked raisins + leaves, flowers, buds and insects. The birds are also given mealworms and other insects while breeding. Touracos are perching birds, who build their nests in isolated trees or bushes well above the ground. The nest is a roughly built platform of sticks and twigs. They breed during a range of months in the various West African countries, from May to October. There are usually 2 eggs, creamy-white or pastel shaded, without a gloss and spherical in shape. Incubation is 21-23 days with both parents attending. The young remain, in the nest for an additional 28 days making their first flight in 38 days. The fledglings are black when they leave the nest and become green during the first moult. The primaries are red, as the adults. They continue to depend on their parents for up to 15 weeks.